So what does it take to reach cracking speeds topping 154 Billion hashes per second with multiple hashes? 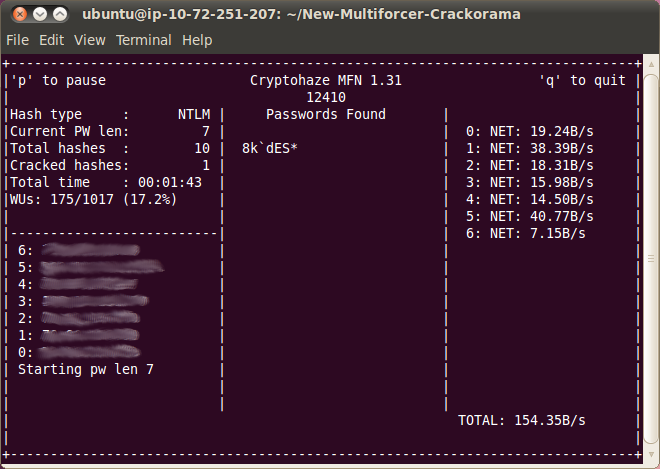 How about the Cryptohaze Multiforcer network enabled password cracker program, 6 computers and 20 video cards? The crazy fast speed was attained cracking 10 hashes! They were also able to obtain speeds of 139 B/s on 1000 NTLM hashes, 101 B/s on 1000 MD5, and 30 B/s on 1000 SHA1 hashes. The computers where setup in 4 separate physical locations and the server was an Amazon EC2 m1.small node. The Multiforcer system code allowed all these systems to work together, OVER THE INTERNET! The tool was created to help out pentesters who need to crack passwords, but can not submit hashes obtained to online cracking programs due to auditing agreement restrictions. Pretty cool stuff, for more information check out the Cryptohaze Blog, downloads are available from Cryptohaze.com, or better yet check out lead developer BitWeasil’s talk, “Cryptohaze Cloud Cracking” from Defcon 20.